The Food Alphabet and More: YUMMY summer treats to enjoy! Can you feel the heat? Summer is definitely here, everybody’s gearing up for what represents both altogether -- scrumptious seafood, sandy beaches, and dream vacations. 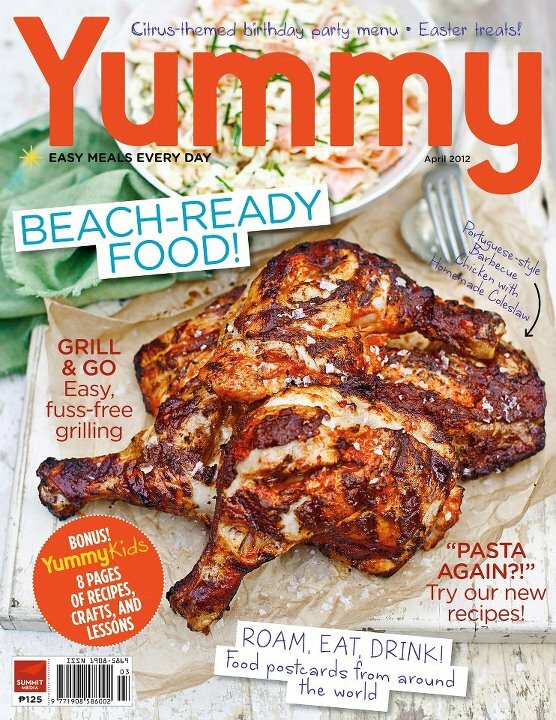 This April, YUMMY magazine is the perfect companion to guide you through the culinary highlights of the season. Summertime cooking means preparing easy, no-fuss meals for the family. YUMMY gives you five grilled meal ideas perfect for beach trips. Take grilling in the backyard a notch higher with YUMMY’s delicious, out of the ordinary recipes to follow for every day of the week. Plus, YUMMY’s around the world special lets you experience the culture and cuisine of other countries without having to step out of your own doorstep! Get a glimpse of the eats and treats of Spain, Japan, Morocco, USA, Vietnam, and Italy in this month’s issue. Now that school is out, keep your kids busy all summer long with fun, DIY activities they can do in the kitchen! This month’s YUMMY Kids section features child-friendly recipes for your little ones. Let them play chef as they make their own pizza, lasagna, and cookies! Also, YUMMY shows you how oranges, lemons, and grapefruit can add pizzazz to your usual menu. Pour over this issue’s citrus-inspired recipes and have your next birthday bash filled with dishes more mouth-watering than the last. YUMMY has you all set for summer! Grab a copy of the April of YUMMY, available in newsstands, bookstores and supermarkets nationwide. For more of YUMMY online, visit www.YUMMY.ph. Become a fan on Facebook via facebook.com/yummymagazine, and follow them on Twitter via twitter.com/yummyph. I wish grilling would be easier for us here because I love grilled food - chicken, pork, fish, veggies and fruits! These are just so adorable and eye catching yummy treats to enjoy. I love such foods and usually experiment with them. For my son’s birthday I want to host a fun party at a nearby rental LA venue. I have some common theme ideas in mind that almost everyone uses but want to do something out of the box. Was just wondering if you can host some unusual themes!